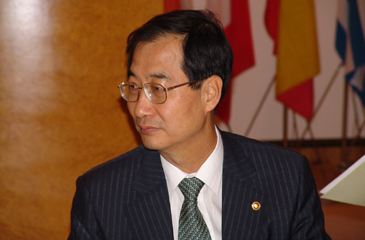 The Financial Sector Committees of the European Union Chamber of Commerce in Korea (EUCCK, www.eucck.org) invite you to a luncheon meeting with Dr. Han Duck-Soo, deputy prime minister and minister of finance and economy on Wednesday, Nov. 2, 2005. Minister Han will speak on "Recent developments in Korean Economy and plans for building Northeast Asian Financial Hub." It may be recalled that the government had adopted in December 2003, "the Policy on Developing a Northeast Asian Financial Hub," with a view of fostering the financial industry as a new growth engine. Since then a lot has been done toward achieving this goal, and we now see some small but significant achievements. However, the EUCCK is of the opinion that much more needs to be done, if Korea is to develop truly as a financial hub of the region. To make Korea a financial hub, a solid financial infrastructure, meeting international standards, has to be built. Highly qualified human resources have to be established. Cooperation of the international financial community has to be secured as well. It is in this context that the foreign financial sector in Korea invited Minister Han to speak on his vision for the financial sector in the country. Venue: Hyatt Hotel: Namsan 1& 2, 2nd Fl. The EUCCK has 24 sector-wise committees organized around one industry and run by an elected Chairman, sometimes assisted by one Vice-Chairman or Co-Chairman. The Committees develop ideas and thoughts that establish the chamber's overall position on relevant matters in each industry and are essential in outlining main trade barriers to EU companies in Korea. The purpose of the EUCCK Asset Management & Securities Committee (formed only last month), is to provide a platform of discussion between the foreign asset-management and securities houses in Korea, the regulatory agencies and other third parties in an effort to enhance securities business practices and develop a stronger and more stable capital market in Korea. The importance of the development of a stable capital market as part of the Korean domestic economy is recognized by the Korean government. The Asset Management & Securities Committee seeks to address issues for the sole purpose of improving the Korean securities business environment and bringing it to international standards. The Banking Committee and the Insurance Committee comprise leading financial institutions from the EU. They monitor changes of regulatory policy in Europe and suggest methods of enhancing Korea's local market competitiveness. European banks believe they can greatly contribute to the improvement of banking practices and know-how in Korea and have positive co-operation with their Korean counterparts implemented on a mutual benefit basis. The Insurance Committee draws the continuous attention of the Korean Government on insurance-related issues, mostly concerning the long-term soundness of the industry.